Whether in music or visual art, theater or creative writing, the pursuit of one’s unique and personal expression remains at the core of art making, and indeed of fulfilling one of the great purposes of life. Zachary Green has been working as a teaching artist in the New York/New Jersey area since 2001, when he joined the staff of the Institute for Arts and Humanities Education, under the helm of Maureen Heffernan. He has worked with such groups as Young Audiences of New Jersey, Arts Horizons, and other affiliates of the Arts In Education Consortium, as well as others. In 2005, the NJ State Council on the Arts selected Zach for inclusion on their roster of teaching artists, a position that was renewed in 2008, and one he maintains currently. Among Zach’s notable programs are his adaptations of complex craft techniques for young artists. The “Glass-less Stained Glass™” is a workshop in which large communities of people (often 100 or more) can collaborate on a huge 10’ diameter stained glass rose window, made out of child-safe materials, and these have been completed many times by many groups in NY and NJ, where they still hang in windows and glow in the sunlight. “Freakybatiki™” is an adaptation of the ancient cloth-dyeing technique of Batik, and has been presented many times to young artists ages 5-50, and has often culminated in large-scale tapestry collaborations, which brightly reflect the characters who contributed to them. 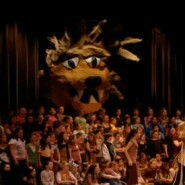 Zach has made hundreds of giant puppets with young people, in schools and community centers all over NYC and NJ, and with them performed on stages, in parades, and at festivals, rallies and protests. Zach has presented songwriting workshops to school teachers in Professional Development seminars and to elementary school children together with their parents. He has worked senior citizens on memory sculptures, working with clay, and in paper-casting. Zach’s programs are as varied in their content and the medium in which they are delivered as the myriad people with whom he has worked. 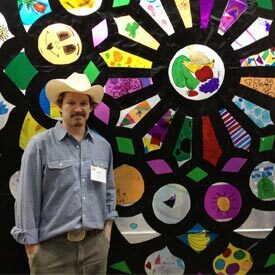 A trained and self-employed stained glass maker, Zach founded and operates the Princeton Stained Glass Company. Zach is also a writer, a multi-instrumentalist musician and songwriter, an actor and puppeteer, a photographer, a painter, a sculptor and carpenter, and he brings these vocabularies with him to all his programs, often citing the commonalities between them. His workshops aim to empower, and he in turn, is always empowered as well. Having taught “students” of all ages, from 3 to 93, Zach has been privileged to meet and collaborate with folks across wide socio-cultural platforms, and carries with him a piece from each one of these encounters in his life’s work. This is truly the integration of art with science...co-op students are seeing connections in the world that other children might overlook.